�����The metals are being hammered in early trading this morning. Gold is down over $45, currently at $1,665. Silver is $31.11, lower by $1.12. Several analysts predicted this downturn last week because of a lack of overall confidence in the economy. Whether buyers find this a good time to take advantage of lower prices will be determined in the next few days. As for now, Proof Gold Eagles are trading at $1,840 per ounce and Silver Eagles are in the $70 range. Proof Silver Eagles are showing strength despite lower Silver. Silver bags are down to $22,025, while Silver Dollars are now at $26,625 per $1,000 bag. �����The coin market is showing signs of weakness for average coins dated after 1930. Many dealers are finding that they have to discount the more common coins if they want to make them go away. The majority of dealers have plenty of average inventories so adding to it is not a priority. A look at this week's LD Wholesale Market Dealer Price Guide shows that later date Buffalo Nickels and Mercury Dimes still lack buyers at current levels. The 1913 S TI Buffalo Nickel in MS63 is down to $140 and the 1916 in MS64 is lower at $93 Market. Common MS65's are only $40 per and we don't see many current buyers at this level. The 1935 D Mercury Dime in MS66 fell to $175. Common MS66 Mercury Dimes are down to $29. �����Early Seated coins are stable at current levels but we do not see a lot of them trading in this market. 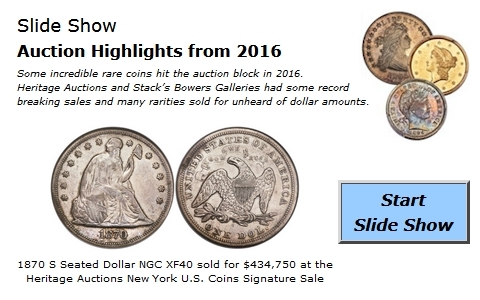 Most sellers want premiums and buyers are looking for coins with exceptional eye appeal. While we don't show many increases in Market values this week, the most widely sought coins are better date Seated Quarters in nice circulated grades. Many of these coins are not available at current levels because sellers know they will command a premium. Many of the San Francisco minted coins in the 1850's and '60's are very difficult to locate and will bring strong competition in most auctions.